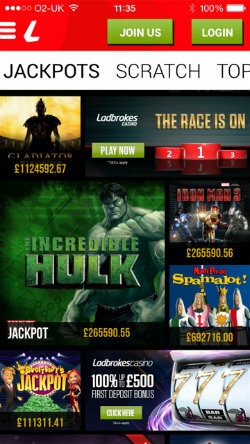 Enjoy the very best of Ladbrokes Casino on your i-Pad or i-Phone with the Ladbrokes Casino App. It features premium titles, so you can tilt, swipe and tap your way to winning big with faster and more vivid games. The app features top mobile casino games provided by leading software developer Playtech. Get generous casino bonuses and play Roulette, Blackjack and slots on your mobile, with video pokers and progressive jackpots to boot. You can use your existing Ladbrokes sign in to play casino games on the app. New players can claim multiple casino bonuses with a range of sign up offers to rival any other UK online casinos. Get the ball rolling with a 100% deposit bonus, up to £500 before going on to claim further bonuses on subsequent deposits for a potential total of £1500 in free casino money. Tap the link above to access the Ladbrokes Casino mobile site. From here you can claim your sign up offers. The welcome bonus is also available to desktop customers. If you’re reading this review on a PC or laptop, you can use the same link to register and sign-up at Ladbrokes Casino. After completing the registration process and claiming your welcome bonus, just visit to the App store and download the iOS app. Once the installation is complete, use your new Ladbrokes sign in details to play casino games on your i-Phone or i-Pad. 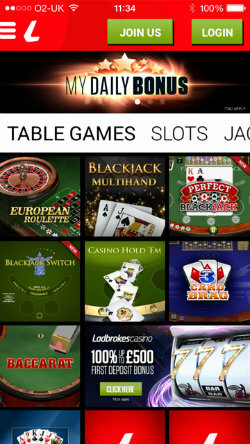 It’s immediately obvious when firing up the Ladbrokes Casino iOS app that a lot of effort has been put into creating a good looking piece of software. You’ll see a rolling slideshow of adverts at the top of the home page, featuring sign up offers, promotions, casino bonuses and competitions. You can swipe back and forth through the adverts and tap on anything that catches your attention to find out more. It’s a well designed app, with a sliding menu to make it easy to filter down games into different categories. 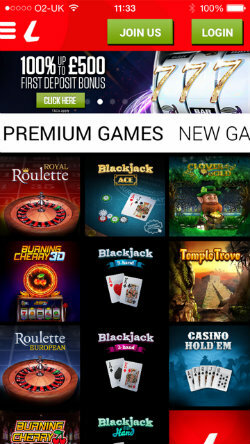 This minimises your browsing time to allow you to concentrate on playing mobile casino games. The categories are; Top Games, Premium Games, New Games, Table Games, Slots, Jackpots and Scratch. Many of the games can be played in free mode, simply tap the image followed by ‘Try It’ or tap ‘Play Now’ to use real cash. The majority of games on the app are produced by Playtech, widely regarded as the best online casino game developer. There is a good variety of Blackjack and Roulette games to go with a range of table and card games. Fans of online slots can enjoy a bumper selection of mobile slot games. There are progressive jackpot slots that build up to huge amounts over time and could win you a huge sum of money from only a small bet. Also on the app, there are instant win scratch card style games that are perfect for a quick play on mobile when you have just a few minutes to spare. Getting around the app is easy enough and the menu button in the top left will give you access to Ladbrokes Casino promotions and daily bonus offers. Here is where you’ll find information on the loyalty scheme and whether you can convert your Comp Points to casino cash. The Ladbrokes Casino iOS app comes highly recommended if you are an i-Phone or i-Pad user with quick page refresh times and fast loading of games on an easy to use platform.